Pamela Roberts is a Certified Executive Chef (CEC) and Certified Culinary Educator (CCE) through the American Culinary Federation (ACF). She has owned her own restaurant, managed food, fixtures and equipment for an exclusive golf resort in Georgia, taught culinary skills to kids and adults; competed in culinary competitions (She has won Gold, Silver and “atta boy” awards from the ACF), worked on “Good Eats” with Alton Brown, a popular national TV show. Pamela writes a food blog “Spoon Feast”, she travels to France on food excursions, takes lots of photographs and has her own cooking show “Charlotte Cooks” that airs on local TV and WTVI a PBS station in the Charlotte area. Charlotte Cooks can be viewed internationally on You Tube. Viewers from all over the world watch the show. Pamela is a food safety expert and registered ServSafe® Instructor with the National Restaurant Association. 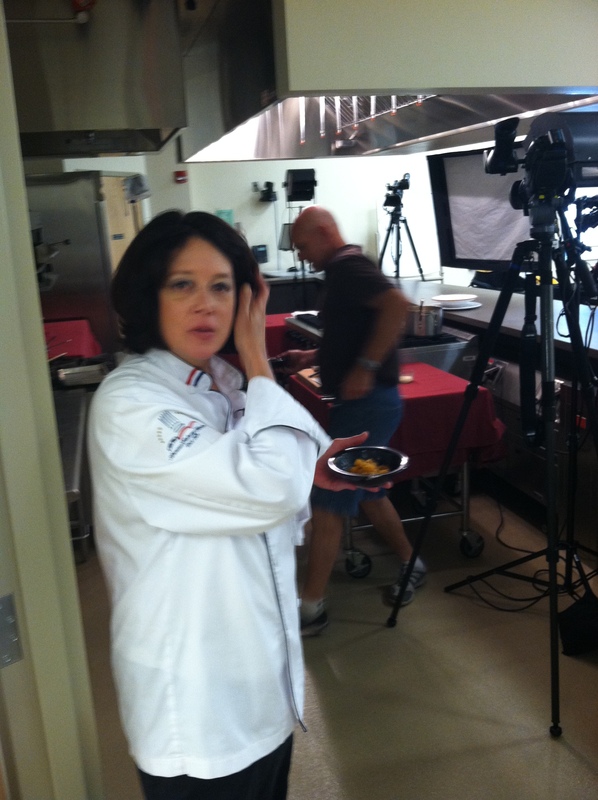 She teaches food safety to restaurants, hotels, hospitals, schools and colleges and culinary students on a college level. She is passionate about food safety and strongly believes education is the key. Most of the time a food borne illness happens is because of ignorance on behalf on the person who is handling food. Pamela has worked professionally in the food industry 1990. Pamela has lived all over the world in Morocco, Spain, England, Japan, Wyoming, Michigan, Florida, and now calls North Carolina home. In addition to living in various spots on the globe, Pamela has also visited Brazil, France, Canada, Mexico, The Rock of Gibraltar, the Bahamas, California, Hawaii, Georgia, Tennessee, and many more states of the union. Vast cultural differences have influenced her perspective on food. Vibrant flavors, vivid colors, complementing textures lend to create exciting meals. Plain, simple grits won’t do. Grits with thyme, garlic, shallots and cheese are more like it. Pamela started this blog to connect better with her viewers of “Charlotte Cooks”. She hopes the blog will lead to writing a book about food with interesting tidbits of origins, how to and recipes. This blog will feature failures and success because cooking and food are real in peoples lives. Not everything turns out perfect every time. Mistakes are pathways to new discoveries. Pamela can be contacted at spoonfeast@gmail.com. She welcomes your comments and ideas. What you experience in the kitchen and around food is important, share! Great stuff…hope to see you soon. Thanks for stopping by Jim! We will be by for dinner soon. I hear only things about Zebra! I’m going to try this recipe on Bob. I love sardines and he’s not a fish lover, but he likes pasta. I hope to change his mind. I hope he likes it. This is one of our favorite dishes. I would like permission to put a link of your blog to my blog, Your recipes look delicious and original. Here is your One Lovely Blog Award. Congratulations! Absolutely adore your blog – it’s incredible! Enjoy your cooking demonstrations on TV .! ..just found your blog and love the focus… just one thing… it’s a little more difficult to read white print on black and other colors… and really difficult on iphone.. Thanks! I am looking at changing the appearance so thank you for the feedback!